Books. Books everywhere. They are taking over my home in their modest unassuming way. Don't get me wrong, I love books. Hubby and I are avid readers, but we're starting to run out of room. And if I put all the books on our bookshelves, where will I put my all my thotchkes? This is a real problem, people. This is one side of our upstairs built-ins. Not quite packed, but pretty durn. 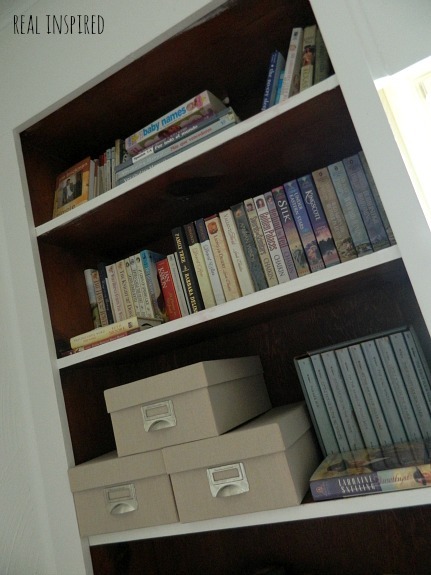 I used to have pretty things on those shelves along with the books. Ah, those good ol' days. 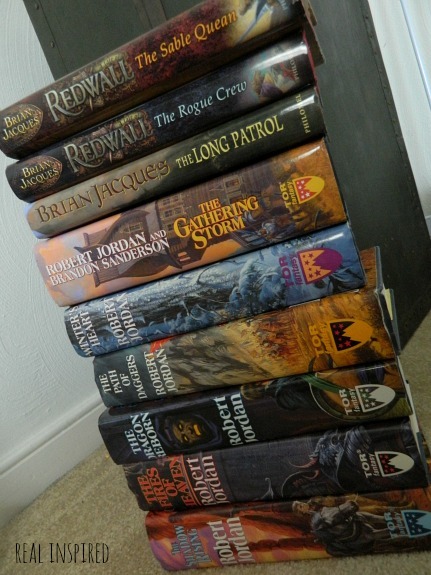 And then Hubby does things like going out and buying bukoos of books at the thrift store. More books. Oh, the humanity! 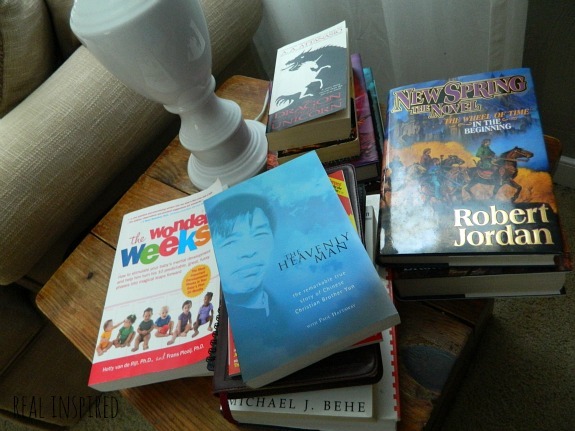 This is what happens when my reading, his reading, books accidentally left by family members, and birthday gifts get together and hang out on my end tables. It's chic, stylish, and won't work with a toddler. I suppose I should probably get rid of some of them, but it is so hard to part with old friends. Do you have any creative uses for books or unique ways of displaying them? Hahaha! Most of the time I have to keep our surfaces clear(except for bloggy pics of course) since little man LOVES to clear them for me. But we wouldn't trade 'em for sure! All images on Real Inspired are copyrighted. I am happy for people to use one or two of my images to reference something I have done, as long as proper attribution is given with a link. The images must not be edited in any way. The images may not be used on Pinterest to link to content that is not mine, unless the site points users back to my website. © Real Inspired 2013-2018. Simple theme. Powered by Blogger.